A young Police Cadet, Christopher Dean, complete with skates some time in the 1970s at the start of his professional partnership with Jayne Torvill, outside the entrance to the 1939 purpose built ice-stadium. Image sourced from the 2018 revival of Dancing on Ice. I recently found this fabulous image of the Ice Stadium which I remember well from childhood (somewhere I have a picture of myself on the ice) which is now only a distant memory as it, and an equally interesting Boots storage facility across the road from it, were pulled down to make room for the new Ice Arena. From Architecture Illustrated "The Ice Stadium, Nottingham, Main Entrance Elevation. Reginald W. Cooper A.R.I.B.A. Architect"
"Emphasis is given to the main entrance by the two columns of Derbyshire Stone. The doors are green with handles and kickplates in stainless steel, the lettering is gilt. The walls are faced with soft Indian red-toned bricks, Ruco Ruberoid roof by Messrs. Ruberoid Co., Ltd., London has been used for the roof of the Stadium." The fire station at the Boots factory, known as D34, erected in 1938 to the designs of Sir Evan Owen Williams, with additions of c1978. * Group Value: strong group value with Buildings D10 and D6, listed at Grade l, (for which it acted as the fire station) and D90, listed at Grade ll*. Jesse Boot, son of John Boot, of the Boots Pure Drug Co., now Boots UK, took the decision to construct a model factory in the 1920s and acquired 156 acres of land to the south of Beeston. In constructing his purpose-built factory Jesse Boot made direct reference to American corporate working models aimed at creating a modern industrial environment – spacious, light and healthy for the workers – alongside the introduction of efficient, process-driven design. The modular, extendable and process-driven scheme reflected the fast changing needs of industrial production. Such concepts of appropriateness and suitability for purpose – using the latest structural techniques and materials – were a driving force in the construction of D10, the wet processes factory (constructed 1930-32) and D6, the dry processes factory (constructed 1937-38), both designed by the civil engineer Sir Evan Owen Williams. D34, the site fire station, was also constructed in 1938 possibly to quell fires in the dry processes factory near which it sits, and also perhaps as a test model for the innovative construction of D6. It has a small side extension added in c.1978. MATERIALS - A reinforced concrete external frame with cantilever beams. PLAN - Rectangular in plan, the building is 8 bays deep and 3 bays wide. EXTERIOR The fire station has a concrete plinth and concrete roofs. The higher, central appliance house has clerestory windows and is flanked by a single-storey, parapeted addition. There are metal, Crittall windows. The front entrance has central, full height doors flanked by single casements in set back wings and in each return angle, full-height glazing. The square hose tower has diagonal bracing, with glass brick infill. A long lamp-light is attached to the wall at the top centre of the entrance. The structural engineering of this building is similar to that of the D6 building and is of the same date. Additions of c.1978 are not of special interest. It seems fitting that Perivale Tube Station should be as stylish as many of its local incumbents, Philco (above), the Hoover Factory, the Firestone Building and others. some still standing, others not - but the Tube station stands as shining example of the Art Moderne surroundings it inhabits. Standing on Horsenden Lane in Greenford, Middlesex (just off the A40 Western Avenue), Perivale is an underground station on the western part of the Central Line. Until the early 1930s public transport in London was operated by a many separate private companies, together operating a fragmented service to passengers. In 1933 the London Passenger Transport Act brought together public transport in London under the control of the London Passenger Transport Board. Tube lines, buses, coaches and trams were combined, although overground lines operated by the mainline railway companies were not included. Along with a massive merger and restructure of the combined assets of the disparate range of companies, London Transport embarked on a works programme to expand and improve the network. Essentially the private companies had barely managed to make a decent enough profit to reward shareholders and reinvest in the network, so much work was required. Using deep tunnels to push out into the suburbs and then above-ground lines, the Underground network was to expand greatly in the proposed 'New Works Programme'. The 'New Works Programme' saw the development of new line extensions, additional tunnelling and track work, new and redeveloped stations and new rolling stock. The programme, introduced in 1935, planned for five year's development. However, the outbreak of the Second World War saw plans put on hold. In post-war Britain London Transport was much less able to embark on an ambitious programme of works. Not only did the network suffer bomb-damage, but rolling stock, tracks and stations had been pressed into prolonged war service. Reinstating pre-war levels of service took priority over new developments. Perivale Underground Station was one such example where the outbreak of hostilities had thwarted developments. Construction began in 1938 to designs by Australian architect Brian Lewis (1906-1991) but it was not completed until 1947, and then only in reduced form. A wing containing shops and a tower were dropped leaving a scaled down scheme. Perivale Station is built around a reinforced concrete frame, evidenced by the radiating concrete beams of the ticket hall ceiling. The front elevation is clad in red brick and has a concave, curved facade. At street level there are two wide entrances either side of a central curved wall with four poster display panels. Each side of the building has a shop unit, either side of the entrances. The western shop is the larger of the two extending out with a convex frontage. Above is a deep, projecting canopy in a serpentine 'S' shape. The metal canopy features illuminated blue-glass panels. The original panels carried separately 'Central Line' lettering, the London Underground roundel and the name 'Perivale Station'. The panels were repeated in sequence across the entire canopy, forming a 'ribbon' of blue glass. Above, is a large clerestory window, providing illumination to the ticket hall behind. The double height window is formed of slender, tall windows between regularly-spaced concrete mullions, with a short return down each side of the building. The window has a thick concrete lintel on top, and on either side, a London Underground roundel mounted at the base of a tall pole. Above, the frontage is topped with a deep, brick parapet. The bricks have a solider course, unlike the stretcher bond of the the rest of the frontage. The Royal York Hotel was built in 1938 and replaced an earlier Victorian hotel of the same name. The advent of the railway and the pier with regular passenger ferries had made Ryde the gateway to the island and a popular destination for holidaymakers. Following its opening the Royal York's smart art deco styling and modern facilities would have been the height of fashion. The hotel boasted a modern spiral staircase, lit by a glass skylight and tall curved windows (see the current pictures which are eerily reminiscent of the Midland Hotel in its derelict state). There was a ballroom, with decorative round columns and a segmented glass skylight above the stage. There was also a terraced lounge bar/restaurant, games rooms and 3 floors of bedrooms, the smartest of which were en suite, with balconies looking out onto the Solent. The stairwell in what appears to be in better times - but those wrought iron panels don't look very Art Deco to me! By the 1970's the hotels fortunes were on the turn. People were starting to travel abroad more for their holidays and the Royal York probably seemed a bit out of date. A few attempts were made to modernise and refit. This resulted in lots of changes to the fixtures and fittings, which compromised its period styling. In spite of the modernisation work the hotel was still had enough art deco features to justify it being listed in 1998. It also forms part of the Ryde conservation Area. The listing information is interesting as it suggests the staircase is now missing a metal balustrade supported by pairs of female figurines to 1st flight. Another coincidence with the Midland Hotel - missing balustrades seem to be all the rage. By the early 2000s the hotel was only offering limited facilities before finally closing around 2006. Once again echoing the fate of the Midland Hotel. But has anything happened since this report? For many, many years, people have been concerned about what is happening to the iconic Royal York Hotel in Ryde. OnTheWight understands that there’s an interesting development that could well be good news and is likely to be welcomed by many in Ryde. Long negotiation - After a long period of negotiation between the building’s owner and the Isle of Wight council planning department, new plans for the Art Deco-style Listed Building have been submitted to the council’s planning department. The plans, once made public, will show a planning application for a thirty bed hotel and four flats on the site. "The Grade I listed building, D6, was designed by the engineer Sir E. Owen Williams who was also responsible for the construction of its sister building, the D10 ‘Wets’ factory, which produced goods such as creams, pastes and liquids. D6 was known as the ‘Drys’ factory because it was responsible for the manufacture, storage and despatch of pills and tablets as well as other products including: pastilles and lozenges, medicated confectionary, capsules and polyfusors. There were also separate rooms on the first floor which manufactured products for the Farms and Gardens Department (veterinary and specialist garden) and the Toiletry Department (powders, bath salts and bath tablets). The factory was built with efficiency in mind. Raw materials were unloaded at the north dock and stored on the third floor before naturally descending, aided by gravity, down spiral chutes, to the manufacturing plant on the second and first floors. Railway tracks also flanked both sides of the building with goods being received along one side, manufactured in the middle and despatched along the whole length of the opposite side. The Curzon Cinema in Carrington, Nottingham only a stone's throw away from Church Drive (where I was born and lived/or had as a home base until the age of 24) and the Art Deco Carrington Lido where I learned to swim. I remember vividly going to this cinema with my father and sister and I most decidedly remember those oh so steep steps - well they were to me! I was six years old when the cinema was closed so I must have been started going quite early on in my life. BIRKDALE GOLF CLUB’S new clubhouse at Hillside, erected at a cost of £10,000, will be opened this evening by the club’s captain, Mr. Alfred Marland. After the opening ceremony, over which the Mayor of Southport (Councillor A. A. Ashton) will preside, the captain is to give a dinner at which all the captains of the Merseyside golf clubs will be present. The new building designed by Mr. George Tonge, of Southport, who was also the architect for the Garrick Theatre, is undoubtedly the most striking building of its kind in the golfing world. According to Mr. Marland it is unique. He told a "Lancashire Daily Post" reporter to-day that he had seen golf houses in all parts of this country, the United States and France, but he had never seen one yet to approach the new Birkdale club house. The building is in the form of a ship, with the storeys rising like decks, and the walls bulging in the middle from elongated ends. SUN-BATHING - Non-golfers are even catered for in the many amenities provided. There are special facilities for sun-bathing on the two promenade decks which overlook the last hole, in one corner of which it would be possible to have a game of deck tennis. Downstairs in the lounge special sun-trap windows have been fitted. The interior decorations and fittings are considered the last word and have been obtained by subscription lists organised by the captain and the lady captain (Mrs. Marland), Members and friends have given £1,750, while others have made gifts in kind, including billiards table. Here the lighting is a new invention, designed to entirely eliminate shadows on the table. In addition to all this a new private road leading from Waterloo-road—a distance of quarter of a mile—has been constructed at a cost of £1,500, while £5,000 has been spent on the course. As result Birkdale is now one the finest spots for golf in the British Isles and is certain to stage the British Open Championship in the next few years. Altogether in the past five years Birkdale has spent £16,000 to place Itself on the top the golfing world. He could not have put it better. The Birkdale clubhouse is not like other clubhouses, particularly those at other courses which host The Open. There is something impressive about it from certain angles—its geometry, expansive bay windows, sharp lines and all-white brightness—and then from a different take it can look less than ordinary, like a functional boiler unit everyone ignores in a parking lot. As for being a liner sailing through the sand dunes, that was the intention of local architect, George E. Tonge, when he won a competition to design the clubhouse. According to Birkdale’s archives, Tonge said, “I visualized the kind of clubhouse that I thought ought to intrude itself onto this lovely course. I imagined the lines of a liner at sea; the perfect balance of the ship at whatever angle and from whatever side it was seen.” Tonge had imagination in waves, you have to give him that. There is brilliance in his geometric concept and it is fitting not only because of the surrounding landscape, with the rolling sand dunes of Birkdale meeting the heaving waters of the Irish Sea, but because of the famous shipping traditions of nearby Liverpool, an industry spurred by the prolific Lancashire cotton trade that evolved out of the industrial revolution. The clubhouse opened on July 6, 1935, with the turn of a ceremonial golden key. Birkdale’s original clubhouse had been a converted, wooden hospital building by what is today the fourth green, and which was the 18th at the turn of the 19th century. This tatty clubhouse was not in keeping with the intentions of the club and its council landlords to develop a club of international standing, and the old building was demolished before Tonge’s replacement opened. One omission from original Tonge’s creation—built at a cost of just over $10,000—was a professional’s workshop, so as a cost-effective solution the council decided to re-locate the tatty old wooden shed in which the pro had been previously housed. Tonge was horrified, telling the club it was “not in harmony with the new clubhouse”. But this was between the World Wars, the economic climate was bleak and Birkdale and the council had already stretched themselves to build the new clubhouse in the first place. To protect his masterpiece Tonge did the gentlemanly thing and designed a new workshop and caddie shelter in keeping with the clubhouse, free of charge. The entire extension cost $385, although a new pro shop and locker rooms were built in time for The Open the last time it was at Birkdale, in 2008. No doubt Tonge would take issue with some of the clubhouse extensions that have followed over the course of time, but they have all been made—painstakingly and expensively—in keeping with his original design. The spirit of Tonge’s design has been loyally preserved, and much more so here than at one of his other celebrated art deco creations, the Garrick Theatre, prominently located near Birkdale, on Southport’s Lord Street. That eventually became the Mecca bingo hall, so Tonge should be grateful to the efforts of Birkdale’s membership. Source Bournemouthecho.co.uk (edited) : Eighty years ago today, a grand new building became the home of the Echo. That Monday’s paper was the first to be produced from a glamorous Art Deco headquarters on Bournemouth’s Richmond Hill. But the move in 1934 was a move into an exciting new era. Work had started in 1933 on a site half-way up Richmond Hill, between Albert Road and Yelverton Road. The project used half a million bricks and large quantities of white Monks Park Bath stone, as well as Purbeck stone in which discerning passers-by can still spot the fossils of shellfish from a million years ago. Art Deco had come to Bournemouth in the 1920s. The opening of the tomb of Tutankhamun had encouraged an interest in all things Egyptian, with buildings in sandy colours bearing decorations reminiscent of hieroglyphics. Another influence on Art Deco was the design of ocean liners, which shows itself in the prow-like curves on the corners of the Echo building. The paper moved into this impressive building overnight on January 13 to 14 1934. At 7pm on Saturday January 13, news and sports results were still being delivered to the old premises by private wire. After that, the process of switching over the telegraphic equipment began. Dynamos, transmitters and tape printers had to be up and running in their new home by the next morning. The move was made harder by stormy weather much like that of this month. On Sunday, the private wire was sent special messages to test the printer links. Meanwhile, reporters began receiving details by telephone of the overnight gale damage. On Monday morning, 15 two-ton Linotype machines were producing lettering in lead. The building may have been state-of-the-art in the 1930s, but within 30 years the paper needed to expand. The paper’s publisher, Southern Newspapers, bought the New Royal Theatre next door in order to provide space for extension. In 1960, the theatre’s Grand Hall was taken over to provide more space. But the expansion involved more than knocking down some walls. Two new presses weighed 50 tons more than the old ones, meaning the foundations had to be strengthened. Meanwhile, a ramp was built so that lorries could fill up from the dispatch department at the Albert Road side of the building and leave at the Yelverton Road exit, uphill. All this had to be done without compromising the existing building. The mayor, Cllr Deric Scott, was invited to push the button that started the first of the new presses on September 18 1961. A year later, the second began to roll, after the completion of the £500,000 underpinning operation. The newspaper industry underwent a transformation in the 1980s, with computer-set pages replacing the old hot metal technology. The advance of technology was to mean the paper needed less space rather than more. The paper could be printed faster on new presses shared with other titles, first in Southampton and later in Weymouth. That meant a large amount of space could be leased out and turned into an award-winning restaurant – called, appropriately, the Print Room. The opening of the Print Room means diners can take a look for themselves at some of that spectacular 1930s architecture. And for anyone travelling along Richmond Hill, the illuminated views of the Daily Echo’s grade II listed central stairwell provide a spectacular glimpse of Art Deco at its most elegant. A former architect who worked on the Daily Echo building 80 years ago has paid a return visit. The Rev Lawrence Squires, aged 102, was a junior architect when he was hired to work on the grand art deco building on Richmond Hill, completed in 1934. He returned yesterday after reading a feature in the paper’s Echoes section about the building’s 80th anniversary. Mr Squires worked on the original public reception, which is now the Ink Bar in front of the Print Room restaurant. “The structure was up but it was empty inside. I was given the job of finishing the public reception at on the corner of Albert Road and Richmond Hill, where there were the three little steps up to the double doors,” he remembered. "A lot of money changed hands there because of the advertisements,” he said. Mr Squires had been hired by the building’s architect, Mr Seward. “He was the big architect in Bournemouth at the time. All the buildings from Westover Road from the motor showrooms toward Richmond Hill were his,” he said. “He employed four or five staff and I heard he needed an extra hand in the office because of the Echo,” he said. Mr Squires was a member of the Congregational Church on Richmond Hill, through which he met his future wife Marion. They married in 1940 and remained together until her death 58 years later. He went on to design houses at Tuckton Road in Southbourne and at Castle Lane. After being ordained in 1940 as a minister in what was to become the United Reformed Church, he went to Jamaica to do a mix of missionary work and designing buildings. He was still preaching at Immanuel Church in Southbourne in his 90s. Mr Squires now lives in a care home in New Milton but returned to Bournemouth to see the Echo building and enjoy tea in the Print Room. He remembered the Echo’s art deco design being the height of fashion. “It was modern. It was really up to date. There were quite a few being put up at that time in that style. It may have been the biggest but it wasn’t the only one,” he said. Although Morecambe prides itself on the newly restored Midland Hotel it also boasted many other Streamline Modern / Art Deco buildings some now lost forever. Don's Café is one of the many casualties. The history of the Don Café has not been easy to compile and although an owner is named in newspaper articles no specific architectural information is available - here is what I have managed to discover so far. "Proposals for a pier were publicised in 1867 and construction began in 1868. It opened on 25th March 1869 having cost £10,000. It was enlarged in the early 1870s at a cost of £5,000. The 912 foot structure included a large pier-head, ideal for the steamers that called until 1914. In 1897/8, a pavilion was added but it was destroyed by fire on 31st July 1933 and a new, 2000-seat pavilion/ballroom was built in 1935/6 at a cost of £25,000. Other facilities included open-air roller-skating, the Marine café and motorboat cruises around the bay. The pier closed at Easter 1986 after decking collapsed at the seaward end. A fire on 4th February 1987 damaged the amusement arcade at the shoreward end and, in November 1989, the owners were instructed by the Council to either upgrade or demolish the structure. The pier was sold in January 1990 and repair work began. However, in March 1991, a Council report effectively condemned the pier. The ballroom was destroyed by fire on Easter Sunday 1991 and demolition began in March 1992." So whilst life was being given to the Midland Hotel not far away along the shoreline, the central pier was destroyed by fire in 1933. In general terms the pier seemed prone to bad luck and multiple instances of fire. The first reference to the pier (that I can find) after its untimely destruction is in a newspaper article in the Lancashire Daily Post dated 28th December 1934 with the screaming headline "Plans for Morecambe Pier rebuilding turned down. Objections to proposed sites of cafés turned down"
The objections and concerns, however, were smoothed out as the next substantial and wonderful reference I found was the official announcement of the opening of the new Central Pier in the Lancashire Daily Post dated 18th July 1935. The opening paragraph states "After providing a topic for several Town Council discussions, the new Central Pier at Morecambe, which has been reconstructed at a cost of £50,000, will give the resort once more a seafront worthy of its name when it is officially opened tomorrow. The destruction of the old pier in July, 1933, left a real scar on the promenade, for the seaward end was a mere mess of tangled metal, but since early this year the ugly skeleton has been removed and made into a fine pier structure by the new proprietors. Thus after two years, when visitors to Morecambe, apart from the local residents, have missed this essential seaside amenity, the scheme is bound to earn praise from all quarters, and especially from the tradesmen of the town." It then mentions the 'New Café' - "At the entrance to the pier, about 100 feet from the forebay, a modification to the original plan, is a two-storey café, also of the latest design, with the turnstiles to the pier on the eastward side, so that there is free access to the promenade to the front of the café, which has been named the ‘Don’. Opened by the Mayor of Morecambe and Heysham, Alderman T. Waite, at the end of June at an inaugural luncheon attended by the directors of the new pier company, this building too, contains and electric fire alarm, and among other electric appliances in the café are the cooking apparatus and a floor polisher." The article then names the owners of the pier company but does not specifically name them as owners of the café but it is good to see attention paid to the style of the building. No further specific mention is made of the café as a functioning business but the advertising space certainly shows that this structure was meant to play a major role on the pier. Following this, I found two more references to fire and mishaps at the Don Café - two instances of fire occurred in 1935 on the same day, just a week after it was officially opened and before the pier was opened to the public! (source : Lancashire Daily Post). There is also a name of an occupant given, Mr T Horne, but was he the owner? An advertisement from 1946 and a reported scalding in 1952 (source Lancaster Guardian and Observer) - but how much longer the café existed after 1952 I have yet to determine. Whilst searching ebay for images of the Don Café I hope to establish more timelines. I have established through newspaper reports and advertisements that the café was still functioning in 1952 but a postcard which an ebay seller says is postmarked 1966 (not shown) shows that the café is no longer a feature. Transformation: The pumps, which were installed in the late 1940s or early 1950s, add to the character of this unique art deco listed garage. Complete with swaying palm trees, this stunning art deco building would not look out of place on the French Riviera (or even Miami). But it’s actually in West Sussex and has been lovingly restored to its former glory after failing into a state of disrepair. The 1930s petrol station – called the Manor Road Garage – has been converted into a series of luxury apartment, with a two-bedroom flat on the market for £300,000. As these stunning images show, the weed-infested court yard has been stripped and replaced by gleaming tarmac. And the four petrol pubs, faded by the sun, and four decades of neglect have been buffed, shined and painted a brilliant yellow. The windows that were previously boarded up have been replaced and restored to their former glory. The sign, saying 'Manor Road Garage', remains but it has been repainted and now stands in front of four fully lit up Shell petrol pumps. The historically important art deco influenced facade of the former Manor Road Garage at East Preston in West Sussex has been fully restored and now fronts a development of private homes. On the 22nd May 1930 an application was submitted by an F H Songhurst (the owner or architect) for an extension to Manor Road Garage. The builders were Boulton and Paul of Norwich, a firm of note who also had a tradition of supplying prefabricated buildings and motor houses, publishing a catalogue of the latter. On 22nd January 1934 an application was submitted by a Mr E R Peacock for alterations and additions to Manor Road Garage, and was approved that month. These are likely to have included the Moderne style frontage building. Unusual 1930s ship-shaped school building (reminiscent from the front of the Aviator in Sywell) which has been converted into a nursery. Dropped ceilings and child-height porthole windows give suitable scale of space whilst complementing external elevations. Grade II listed. Civic Trust commendation 2000. This elegant building was designed by the architects to the Borough of Ilford in 1934, although no individual name has been traced. It was built for the teaching of domestic science subjects but, like many of its contemporaries, was abandoned and left to stand empty since 1983. "Nottingham and Over Half a Century's Association - THE HISTORY OF BOOTS THE CHEMISTS is indissolubly linked with that of the CITY. The association dates back beyond 1860 when the tiny herbalist's shop Goose Gate was founded by the father of the 1st Lord Trent, whose vision made possible the great organisation that serves hundreds of cities and towns in Great Britain, through more than 1,100 branches. Nottingham was the birthplace of the House of BOOTS. To-day remains the nerve centre which feeds the furthermost branch. Citizens of Nottingham are well aware of this close relationship of which BOOTS are profoundly proud. The BEESTON FACTORY — that wonder of modem industrial architecture — stands as the realisation of the Founder's dream; a perfectly equipped headquarters of an Army devoted to the service of the community. The growth in importance - civic and industrial — of this City is a source of satisfaction to a firm which has so intimately participated in its history. BOOTS PURE DRUG CO. LTD. NOTTINGHAM"
"Boots 9 New Robot Factory. Engineers’ Society Visit Beeston. The members of the Nottingham Society of Engineers, of which Mr. W. H. Hewlett It the president, to the number at 55, had the privilege of Inspecting the magnificent new works of Messrs. Boots Pure Drug Co. at Beeston yesterday afternoon. The party, which addition to the president, included Mr. M A. Crosbie, vice-president, Mr. C. J. Hofton, Mr. Chas. Derry, Mr. Geo. Stevenson. Mr. R. J. Anson. and the secretary. Mr, A. O. Weller, were met by Messrs. Boots’ chief engineer. Mr C. H. Jessop and Mr. 11. L. Booth, assistant engineer, and made a thorough inspection of the extensive works from the first aid surgery on the top storey to the bulk storage department in the basement. Largest in Europe – the factory, which is the largest single factory in Europe, is the last word in the most modern, glass, steel and concrete construction. It occupies an area of 280 acres, and at the present time 1,600 workpeople are employed. It is steadily growing and will ultimately cost something in the neighbourhood of two million pounds, and provide employment for between 5,000 and 6,000 workpeople. The visitors were shown through the various departments, and the elaborate processes involved in the production of Messrs. Boots products were carefully explained. Mechanical Work-Savers – Mechanical methods are adopted for almost everything, and much interest was shown in the conveyors and chutes operating for the transport of materials from one department to another and the ingenious for the delivery of orders to the various branches, After the inspection tea was provided and the visitors expressed their appreciation of the courtesy and hospitality of Messrs. Boots. 1933 - White Gables in Gerrards Cross, Bucks. From the Daily Telegraph web-site : "White Gables a landmark art deco number built for the head of the Cunard shipping line with four bedrooms, pool and sun room just outside Gerrards Cross in Buckinghamshire, has been a favourite with the makers of the Hercule Poirot television series." Hopefully you can see the same thing as I can - the similarity between the design of all three buildings. The Scala Cinema was demolished in either 2001 or 2008 (details are vague) after long languishing as an unloved annexe of the Co-Op which still stands across the square. It says much for Hucknall that it possessed two cinemas built in the Art Deco/Moderne period. The Byron survives as a structure although it is the less visually pleasing of the art deco architecture style whereas the Scala could at least boast a nodding acquaintance with the more attractive streamline moderne designs. 1930 - Closes to install sound! Pyrene Factory, Brentford (1930) by Wallis, Gilbert and Partners. One of a number of Art Deco factories built along the Great West Road in Brentford by Wallis, Gilbert and Partners, leading it to be dubbed, ‘the Golden Mile’. The Pyrene factory is now Grade II listed. Another jewel in the Perivale crown of Art Moderne and Art Deco buildings - so what happened? This one was demolished and subsequently missed the 'eyesore' stage never to be seen again! What makes this particularly galling is that the structure shared the architects of the Hoover Factory! Every conservation society needs a martyr – a demolition so outrageous and shocking that the press and public realise the need for the society. For the Twentieth Century Society the Firestone Factory became its martyr in 1980. Wallis, Gilbert and Partners designed it, and the Hoover Factory, in the style now known as Art Deco but then called jazz modern or moderne. At the time, the influential Architectural Review championed the Modern Movement and the moderne style was anathema. By 1979 this view was in retreat; ornament had begun to seem a tempting alternative to bare bones functionalism and the New Brutalism. The Firestone Building was a distinguished example of Art Deco, built for the American tyre manufacturers, the Firestone Tire and Rubber Company of Akron, Ohio; and the design of the whole building, not just the façade, was based on that of an Egyptian temple. When they decided to cease production in Brentford, they sold the land for development. A call from the Department of the Environment to the developers alerted them that the minister, Michael Heseltine, was going to list the building on Tuesday; on Sunday bulldozers were sent in to demolish the façade. It was a calculated act of philistinism. Simon Jenkins wrote in the first Thirties Society Journal: ‘I can recall few buildings of the last decade whose destruction has produced more spontaneous outrage from laymen.’ Just afterwards, senior civil servant Brian Anthony ‘serendipitously knocked on Heseltine’s door and came up with a plan to prevent the Firestone debacle from happening again’ (obituary in The Times); one of his triumphs was to save the Hoover Factory. That would probably not have happened but for the martyrdom of the Firestone. The stadium's first turf was cut by King George V, and it was first opened to the public on 28 April 1923. First known as the British Empire Exhibition Stadium or simply Empire Stadium, it was built by Sir Robert McAlpine for the British Empire Exhibition of 1924 (extended to 1925). The stadium cost £750,000, and was constructed on the site of an earlier folly called Watkin's Tower. The architects were Sir John Simpson and Maxwell Ayrton and the Head Engineer Sir Owen Williams. 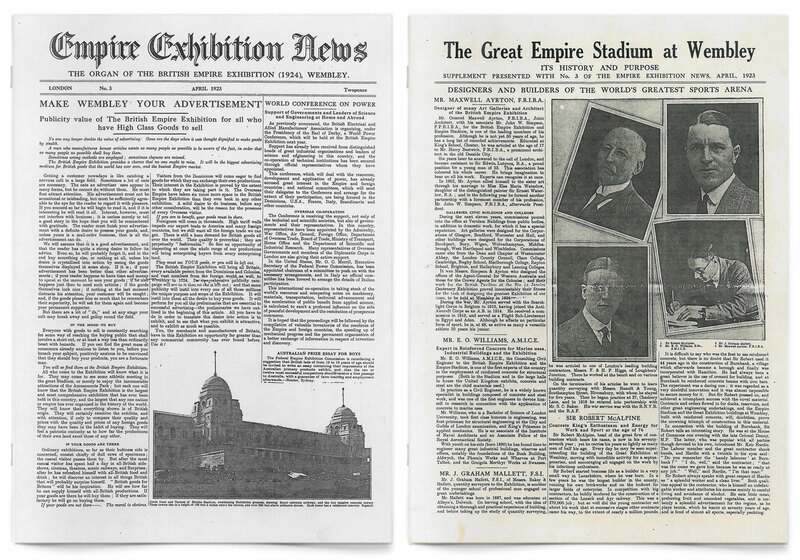 It was originally intended to demolish the stadium at the end of the Exhibition, but it was saved at the suggestion of Sir James Stevenson, a Scot who was chairman of the organising committee for the Empire Exhibition. The ground had been used for football as early as the 1880s. At the end of the exhibition, an entrepreneur Arthur Elvin (later to become Sir Arthur Elvin) started buying the derelict buildings one by one, demolishing them, and selling off the scrap. The stadium had gone into liquidation, after it was pronounced "financially unviable". Elvin offered to buy the stadium for £127,000, using a £12,000 downpayment and the balance plus interest payable over ten years. After complications following the death of James White the original Stadium owner, Elvin bought Wembley Stadium from the new owners, (Wembley Company) at the original price, since they honoured Elvin's original deal. They then immediately bought it back from Elvin, leaving him with a healthy profit. Instead of cash he received shares, which gave him the largest stake in Wembley Stadium and he became chairman. The stadium's distinctive Twin Towers became its trademark and nickname. Also well known were the thirty-nine steps needed to be climbed to reach the Royal box and collect a trophy (and winners'/losers' medals). Wembley was the first pitch to be referred to as "Hallowed Turf", with many stadia around the world borrowing this phrase. The stadium closed in October 2000, and was demolished in 2003 for redevelopment. The top of one of the twin towers was erected as a memorial in the park on the north side of Overton Close in the Saint Raphael's Estate. What a find! What a gem! I have written to Penzance AFC but have not yet had a response, but they do have some history on their website and thanks to Pete Miles blog for a great picture and some interesting thoughts. Apparently this image in the form of a postcard used to be given out to every customer - wish they'd still had them when we visited. We stayed in this public house some years ago whilst in Penzance (first time in Cornwall for me) to attend my brother-in-law's marriage. He had inherited a house on the cliffs which had its own lighthouse (here's me green with envy) which he was required, by law to maintain! Recently Peter and his wife, Ann, have had to give up the heady extremes of the cliffs and move down to a more stately landlubbers existence leaving the lighthouse behind (too sad!). The rest of the brothers and ourselves had decided to stay in the pub rather than disrupt Peter and Ann before their big day. It was a bit of a squeeze and we did actually have the kids out in the corridors overnight as even with the windows and bedroom doors open it was stifling - the expanded family really was too big for the pub, as it was then, to accommodate. On the second night it was a little easier as some of the other guests had vacated and we were able to spread into the additional accommodation. Even with the easing of personal space the pub, then was basic and the art deco features beyond the facade were not 'loved'. It's good to see the renovation work, at least on the exterior although it looks like a lot more on their website and that of the St. Austell Brewery. Advert for the Yacht Inn as printed in 'My Holiday in Penzance' (Penzance Visitor Guide) circa 1960 kindly provided by the Cornish Studies Library in Redruth - a very typical advert of the time but I would suggest the image used is way earlier, look at that fabulous car parked outside! This shows the pub circa mid-1970s and is included (of course) because of the Classic Mini and Mini Estate on the forecourt! Even though I have searched in the intervening years, little is available about the provenance of the public house ore- the 1950s. There are some reminiscences by Susan Glasspool (Bottaro) on the BoakandBailey.com blog but nothing earlier. I will have to do further research on both The Yacht Inn and the Jubilee Lido which it overlooks. Excellent aerial shots (and detail) showing the positions of the Yacht Inn, the Jubilee Pool and local Church in proximity to each other - with grateful thanks, once again, to Susan Glasspool for providing the images. First of all - although built in the Art Deco Style - is it Art Deco/Moderne? The timeline says otherwise as the newsreel shows its opening in 1950 and the interiors are dated at 1948. Old plans from the 1930s resurrected because they were just too good to be lost forever? Very little is available - but what is certain - the Terminal was destroyed in 1983 to make way for a car park!